It is beginning to look a lot like winter, and you know what that means…snowmen! And, this snowman is the Frostiest Snowman of All! (And the cutest too!) This crochet hat pattern is written for sizes Newborn to Adult. 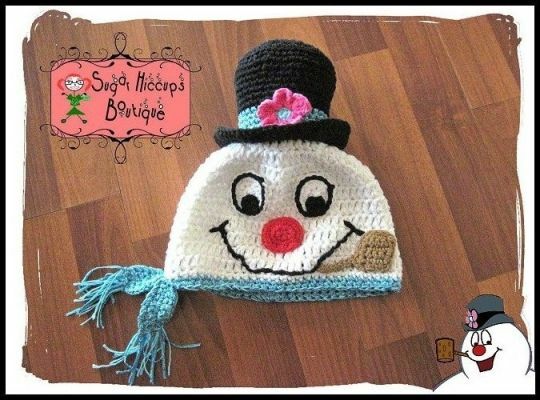 A great gift for any snowman lover! The Frostiest Snowman hat pattern is finished, and is for sale in my Ravelry, Etsy, and Craftsy shops. • Worsted Weight yarns (1 skein white, 1 skein black, small amount of turquoise, pink, red, and tan yarns) Suggestions for yarn could be Red Heart, Caron, Bernat, in acrylics, or if you prefer to use cotton yarns like I do, you can use Peaches & Crème or Lily Sugar ‘n Cream yarn for reference. and I love the colour of blue used. So darn cute! A must have now!